This is an interactive discussion with Kenny Russell and Arthur Bailey who is the author of a great book on the topic. In this teaching you will hear from two seasoned and theologically trained ministers in an interview setting, break down the question. 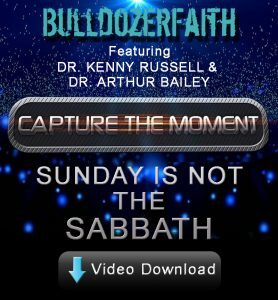 Is Sunday really the Sabbath? Do we know why we traditionally meet on Sunday and can man change one of the commandments? This message will help many line-up with the Biblical call to follow the fourth Commandment. This entry was posted by Kenny Russell. Bookmark the permalink.